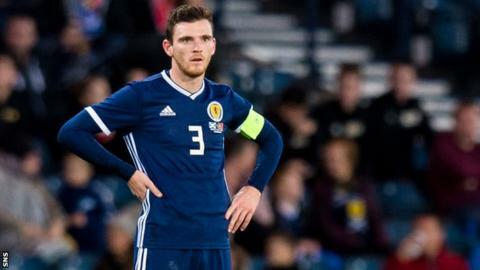 Scotland have not given up hope Andy Robertson will be available for Thursday's opening Euro 2020 qualifier in Kazakhstan. The Liverpool defender is having an operation on an abscess in his mouth, but Scotland assistant coach Peter Grant says there is still a chance he might make the trip. "The way he is, he is still desperate to play and still trying to get himself back out here as well," said Grant. "That's why he is captain." Jordan Archer, Barry Bannan and Charlie Mulgrew have withdrawn from the squad, with Liam Kelly and Stuart Findlay called up. Midfielder Bannan played in Sheffield Wednesday's Saturday win over Blackburn Rovers, a match missed by Rovers defender Mulgrew. And Millwall goalkeeper Archer did not feature in their FA Cup match against Brighton and Hove Albion. Alex McLeish's side face Kazakhstan away on Thursday then travel to face San Marino on Sunday. 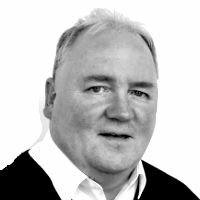 Kelly and Findlay's inclusion means there are five potential debutants for the Scots, with Wednesday defender Liam Palmer, Sheffield United midfielder John Fleck and Hibernian forward Marc McNulty all yet to win their first senior caps. Aberdeen defender Scott McKenna is "a doubt" for Thursday's game, according to Pittodrie manager Derek McInnes. "He wasn't fully fit, but with Andrew Considine failing a fitness test with his calf, he had to go in," said McInnes after Saturday's draw with Livingston. "If he does travel, I'm not sure he'll be fit for that first game. The tightness of the thigh, the travelling, the Astroturf pitch. "I wouldn't want to rule him out - I'm not a medical expert. We need to make a decision between us and Scotland whether he travels." Defenders: David Bates (Hamburg), Stuart Findlay (Kilmarnock), Scott McKenna (Aberdeen), Stephen O'Donnell (Kilmarnock), Liam Palmer (Sheffield Wednesday), Andy Robertson (Liverpool), John Souttar (Heart of Midlothian), Kieran Tierney (Celtic). Midfielders: Stuart Armstrong (Southampton), John Fleck (Sheffield United), John McGinn (Aston Villa), Callum McGregor (Celtic), Kenny McLean (Norwich City), Scott McTominay (Manchester United), Callum Paterson (Cardiff City), Graeme Shinnie (Aberdeen), Oliver Burke (Celtic), James Forrest (Celtic), Ryan Fraser (Bournemouth). Forwards: Oli McBurnie (Swansea City), Marc McNulty (Hibernian), Lewis Morgan (Sunderland), Johnny Russell (Kansas City).